Even if you are not an athlete building muscle, you still may need a protein supplement. Vegetarians are always looking for a non-animal protein and some supplements have emerged to fit in that criteria. Hemp protein is loaded with omega 3 and 6 essential fatty acids which for the aging population is necessary to guard against cardiovascular problems. 65% of hemp’s protein comes from globular protein edestin which is easily digested and absorbed. And it is not a controversial form of marijuana! Peas are not normally considered a source of protein but sourced from yellow peas, pea protein is a great alternative to animal based protein. It has a mild taste and is gaining popularity among vegetarians. Soy protein is a great source but beware. If the soy is not fermented you may be unable to digest it and thereby release some toxins. This is the reason doctors warn against consuming soy if you are prone to cancer. On the other hand, fermented soy actually protects against cancer because the fermentation changes the digestibility and absorption thereby releasing the good cancer fighting components. Spirulina is a great veggie source of protein. As a super food it is approximately 65-71% complete protein and 85-95% digestible. Its amino acids are almost instantaneously absorbed by the body. For those who can tolerate animal protein Whey is definitely the leader. It contains high biological value and is high in branch chain amino acids while being quickly absorbed. It comes in a whey concentrate or a whey isolate (which is slightly more potent). Eggs have been known for their high protein content but many can’t tolerate eggs and many times doctors recommend against eggs for cardiovascular reasons. Milk proteins contain casein and whey and are loaded with amino acids. This type of protein is usually found in protein blend formulas. If you find one that is strictly casein, don’t expect instant absorption. It takes the body 5-7 hours to break down and utilize casein, but is valuable if you take it in the evening and let your body get proteinized while you sleep. *excerpted in part from “The Wonderful World of Protein” by Mark Becker. Vitamin Retailer magazine June 2018. Homocysteine is a naturally-occurring amino acid that is a breakdown product of the essential amino acid, methionine and is linked to cardio problems, cancer and DVT. Normally the homocysteine is converted back into a harmless amino, cysteine but folks with gluten sensitivity may increase its buildup. Low levels of Vitamin B, especially B12 and B6 also puts them at risk. Women with the highest homocysteine levels had 2.3 times the heart attack risk and also had low folic acid levels, which has also been linked to autism. An epidemiological study conducted in 2007 found that men and women with previous colorectal adenomas, who took 1000 mcg of folic acid daily for 6-8 years had increased risk factors for colorectal cancer (10). It is certainly plausible to consider the possible cancer risks associated with excessive folic acid. It is for this reason that certain conventional cancer treatments use folate-blocking drugs such as methotrexate. However, natural folates found in whole foods appear to be metabolized via the intestinal mucosa. A more homogeneous choice would be L-methylfolate which is the biologically active form of vitamin B9. L-Methylfolate (5-MTHF) has emerged as a popular alternative, and has been used as a complementary medicine in several recent clinical trials. Studies show that L-Methyfolate supplementation is equally (if not more) effective than folic acid for increasing circulating folate in those with an MTHFR mutation. It is also highly effective at reducing homocysteine levels in healthy people. It is also better absorbed and interacts with fewer medications than folic acid. Note: To find out whether MTHFR should be on your radar, you can take raw data from 23andme, or another provider like Ancestry, and upload the data to a site like Genetic Genie to determine whether you have one copy, or two copies of either MTHFR C677T, or MTHFR A1298C, the “mutant” versions of the gene. And, if you have enough magnesium you won’t need huge amounts of D. The RDA for magnesium is 420mg for men and 320 for women but our diet only gives us 50% of this. Foods high in refined grains, fat, phosphate and sugar contribute to magnesium deficiencies. Foods providing magnesium are almonds, bananas, beans, broccoli, brown rice, cashews, egg yolk, flaxseed, green veggies, milk, mushrooms, oatmeal, pumpkin and sesame seeds, sunflower seeds, sweet corn and whole grains. But unless you eat a lot of these it may be prudent to take a magnesium supplement. – reprinted in part from Nutraceutical World, April 2018. Alternatives to drugs for stress and anxiety. According to the American Psychological Assn., the number of people who suffer from stress and anxiety has increased by 44% over the last five years. General anxiety disorders affect over 6 million people with women complaining of stress twice as much as men. Stress can be brought on by so many reasons, from rushed deadlines, social fears, childhood trauma, traumatic events to illness. Natural approaches to stress may be tried before drugs. Starting with supporting the brain, good nutrition is essential including foods such as fish, hemp, avocados, coconut and nuts. Since the stress hormones cortisol and adrenaline are responsible for creating equilibrium we need to realize that chronic stress can negatively affect the thyroid, blood sugar, bone density, belly fat production and cognitive performance. In addition to relaxation techniques that include meditation, yoga, exercise, guided imagery and self hypnosis, you may consider taking holy basil which will have a calming effect which acts as a mild nervine due to it’s action that reduces histamine responses in the blood . Ashwaganda is another herb that helps in reducing cortisol levels. Rhodiola rosea is especially effective at curbing depression, decreasing fatigue and enhancing mental sharpness by increasing serotonin levels in the brain. Serotonin is considered the happy hormone. You have to be careful with rhodiola as it needs to be harvested at its peak and not past peak growing. Many cheaper supplements don’t care about that and you won’t get the effectiveness. Astragalus is an adaptogenic herb that helps protect the body from prolonged stress. When processed correctly, it helps inhibit chromosomal instability by creating a healthy telomere microenvironment. This impacts telomere length (caps at the end of the DNA strand that prevents the DNA from unraveling or breaking) reducing cellular death and slows the aging process. L-Theanine is an amino acid (a building block for proteins) found in green tea. Evidence from human electroencephalograph (EEG) studies show that it has a direct effect on the brain. L-theanine significantly increases activity in the alpha frequency band which indicates that it relaxes the mind without inducing drowsiness. It increases serotonin and stimulates the brain’s alpha waves which induces relaxation. These two are a good combination and when I take a supplement that has them in it, I feel happy and my stress levels reduce. I call this MY HAPPY PILL. If you want to read more about it go to the website www.LongLifeNews.com and click on Cell Metrix. I’ve tried lots of supplements for stress and this one seems to get me smiling and let me cope much better with daily stresses, road rage and the computer ! PS>If you want my new free e-book Think and Feel Younger click here. Hydrogenated oils going bye bye! Based on a review of scientific evidence the FDA has finalized its determination that partially hydrogenated oils (PHOs) the primary dietary source of artificial trans fat in processed foods, do not fit the GRAS specifications for use in human foods. Manufactures will now have 3 years to remove them from their products. “This action is expected to reduce coronary heart disease and prevent thousands of fatal heart attacks every year,” says FDAs Acting Commissioner Stephen Ostroff, MD. As we age we need to protect the brain against neurodegeneration, as well as loss of cognitive function and memory. Carnosine has also been shown to rejuvenate connective tissue cells which can assist wound healing and the effects of aging of the skin. Carnosine is a naturally occurring molecule composed of two amino acids, histidine and alanine. Do not confuse it with carnitine. Carnosine is found in higher concentrations of meat and fish so vegans may become deficient. The body can manufacture sufficient quantities but as we age this ability diminishes. By the time we are 70, carnosine levels have been decreased in the body by 63%. Carnosine has been shown to improve muscle function and recovery from muscle fatigue. It also protects against degeneration of the brain and loss of cognitive function associated with aging. Carnosine can improve mental function and behavior in children with autism and ADD and it can also heal peptic ulcers when combined with zinc. You may not know if you are deficient in magnesium or potassium, but if so, it will have a substantial effect on your health. Magnesium is a co-factor in more than 300 enzyme systems that regulate biochemical reactions in the body including protein synthesis, muscle and nerve function, blood glucose control and blood pressure regulation and it is essential to heart health. Studies have shown people have less heart attacks and strokes when they have sufficient levels of magnesium. Diets with good magnesium levels are associated with a significantly lower risk of diabetes as low blood magnesium levels may worsen insulin resistance. Potassium is needed for proper function of cells, tissues and organs. It is also a required electrolyte that conducts electricity and is essential for nerve transmissions. But, potassium must be balanced with other electrolytes including magnesium. It is also crucial to heart health as well as playing a key role in skeletal and smooth muscle contraction which effects not only muscles but digestion as well. Potassium also plays a role in regulating blood pressure in relationship with sodium. Insufficient potassium is associated with poor bone health and muscular weakness including heart failure and cramping. According to the NHANES Dietary Survey done from 2007-2010, none of the 17000 participants met their average requirement for potassium and it was estimated that 52% of Americans do not get their required magnesium each day. Foods high in magnesium are beans and nuts, whole grain bread and green leafy vegetables. Foods high in potassium are squash, yogurt, fish, avocados, beans, green leafy veggies. But if you are concerned that although you eat this you may not get enough, run to the health foods store and get a supplement. Quercetin helps allergies and belly fat! My vet clued me into Quercetin years ago as she was taking it for her allergies and suggested I give it to my cat for his season problems. It worked! Quercetin is the backbone structure for flavonoids, “nature’s biologic response modifiers”. It is the most active of the flavonoids and in clinical trials has demonstrated significant anti-inflammatory and antiallergic activity by inhibiting the manufacture and the release of histamine and other allergic/inflammatory mediators. However, there is a more bioavailable form of this flavonoid: enzymatically modified isoquercitrin (EMIQ). EMIQ greatly increases quercetin levels in the blood compared to the ingestion of quercetin or rutin (another flavonoid). Most clinical studies have used a dosage of 200mg daily of EMIQ which would equal 8000 mg of quercetin. So if you don’t like to take a lot of pills, EMIQ is for you. EMIQ also is great for belly fat reduction. It promotes enzymes that encourage the breakdown of fat within fat cells. Studies have shown subcutaneous fat and waist circumference to be reduced significantly (20%). Quercetin is better absorbed if you take bromelain with it, but EMIQ doesn’t need any “co-factors”. Neither have shown any side-effects even when large quantities have been consumed for up to two years. EMIQ is recognized as safe (GRAS). Both forms may enhance uptake of certain drugs from the intestines so if you take it you may be able to reduce the dosages. Check with your ND about this. 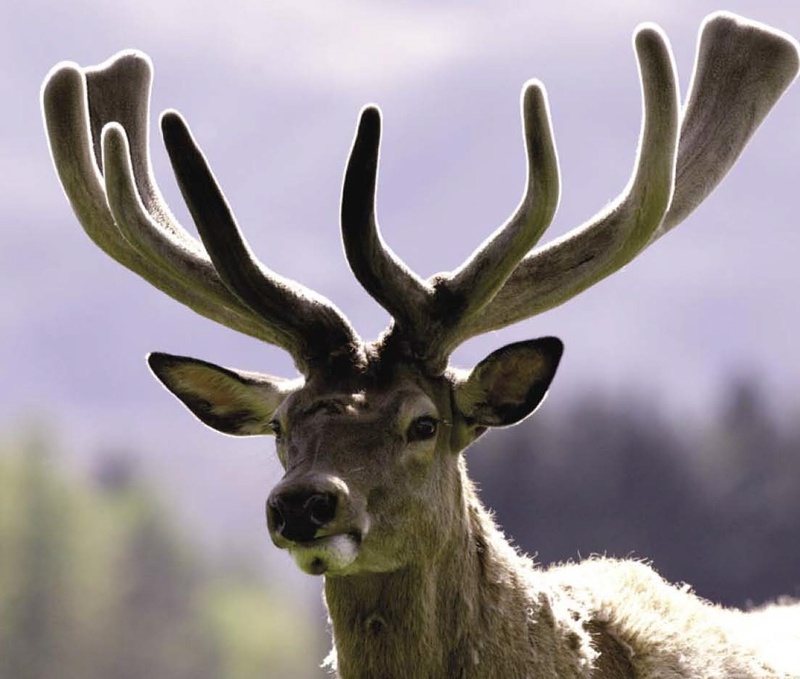 Velvet Antler for Joints, Anti-Aging and Athletes. Deer velvet (humanely harvested fuzz on the antlers) traditionally was used in China over a thousand years ago. Even today, many oriental countries rely on it for its rejuvenation properties, alleviating of menopause symptoms and as an aphrodisiac. In addition users have discovered its good for promoting growth in children, increasing blood in the body, helping cardiovascular disorders, preventing aging and loss of memory, treating menstrual disorders, addressing impotence and infertility and strengthening stamina. Since 1991 New Zealand scientists have been carrying out a unique investigation into the composition and medical properties of velvet at AgResearch Invermay on the South Island. Their studies verified ancient claims to the efficacy of velvet’s properties. A Russian study revealed that velvet antler has hypotensive, erythopoietic, anti-stress stimulating, anti-inflammatory, gonadotrophic, growth and metabolic effects. Athletes have found velvet antler beneficial for repair of stressed joints and for the added stamina and endurance it seems to provide. I personally had meniscus damage in my knees from skiing. Not want to face surgery I tried the New Zealand velvet antler (NZVEL) along with a topical cream that contained CMO (Joint Medic). I hate to say the word “cure”, but I no longer have trick knees, no pain and no clicking in my knee. The combination seems to have restored my synovial fluid and somehow reduced the bone on bone trauma whenever I would run or bike. I used to wear a brace to protect the lateral movement on my knee… no more! I can bike without becoming crippled afterwards and hiking and skiing are no problem anymore. Velvet Antler warrants further investigation if you have a specific condition you think it may help. There is a copy of the book “Velvet Antler, Powerful tonic for joints, infertility, blood pressure, athletic performance and more” available at http://bit.ly/1ncFoid for $1 as a PDF or you can buy the paperback at Amazon http://amzn.to/1oTH0SI. More info on the actual NZVEL product I used is available at http://bit.ly/1kdt55v.